Liberty Pumps are a leading brand of household pumps. If you’ve been in the market for a pump, chances are good you have heard about Liberty and you have come to the right place to learn more about them! What Kind of Pump is the Liberty Pump SJ10, Exactly? The Liberty Pump SJ10 is a 1.5-inch Discharge SumpJet, Water Powered, Backup Pump that is generally installed to assist a primary pump. With a weight of 5 pounds, this pump is made primarily of PVC and has a cord to receive electricity. Batteries are not included nor are they necessary. 1 What Kind of Pump is the Liberty Pump SJ10, Exactly? 2 How Does the Pump Work? The warranty that comes with this pump is relatively standard for the Liberty brand, with a guarantee that it will work properly (barring any issues from the customer using it improperly) for 3 years after purchase. Now that you know a bit about this specific model, what exactly does it do? Why might you want or need it? For starters, it will save your home from drowning in water. The general reason you would buy a pump like this is to protect your basement from flooding from a natural disaster, excessive rains, or when snow begins to melt. Since it is water powered, you will not have to worry about losing power and it not working as it will completely run off your local municipal water supply. This does not apply to well water as the pump for the well water would need electricity. You may also find this product handy if your primary pump ever randomly stops working! As a unique product, it is also a powerful one. On average, this Liberty pump can move 2 gallons of dirty (sump) water by only using 1 gallon! As infrequently as you should need this pump to work, it should not affect your bill by much at all, especially considering what all it is saving you from. Additionally, this SJ10 pump will arrive (or be purchased) fully assembled and ready to be installed! The Liberty Pump SJ10 works a lot like any other sump pump. Due to its smaller size, some people may have a more difficult time imagining that it actually is as powerful as they say. However, you must keep in mind that this pump is a backup pump for a reason. It was not built to run frequently, just occasionally as needed. The major difference between your normal sump pump and this model is that it only runs off of your main water source, also known as ‘city water’ or water that comes from your local municipal water line. The Liberty brand insists you also install a backflow prevention device that has been approved by RPZ. This is not only to protect you and your house but also from allowing any sump water from somehow getting back into the main municipal water line. In addition to the PVC material, all of the smaller components have been made with non-corrosive materials, so rusting should never be an issue. 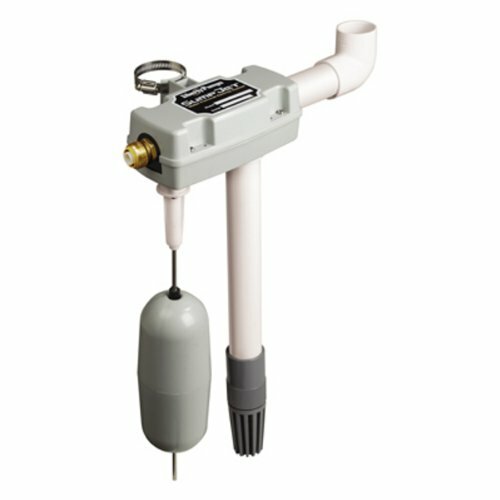 Just like any other sump pump, the Liberty Pump SJ10 has a switch float to turn it on or off as needed. Once initiated, the pump will send the sump water out of the same line as your normal pump would. Living in a flood zone can be the worst! However, I decided to install this pump as a permanent fixture and haven’t had any issues during recent storms. Although the additional parts cost about $70, fittings, ball valve, to make it permanent, it was definitely worth not having to worry about flooding! I am so glad we had a professional do the installation! Our house water was installed a little oddly, so with the additional work, it was worth getting a professional and not trying to do it ourselves. I will say, the Liberty Pump SJ10 is a lot longer than one would think so it was difficult to get it into place, but we made it work. Also, I’d highly recommend getting a backflow valve, just in case! Question: Should you use hot water or cold water as the water supply? Question: Can the built-in foot valve be removed at any point in time? Answer: Prior to installation, you can easily unscrew it. However, as a general idea for future maintenance, if you are able to install it in a way that you can easily access it, that would be a good idea. Question: Will this pump function with an 8-foot lift? Answer: Although only recommended for a maximum of 5 feet, many prior customers have stated they used theirs up to 9 feet with zero issues. As a reminder, this Liberty Pump SJ10 will only benefit you, in the case of your house losing power, if you have city water and not well water. Having said that, it is arguably the best backup pump on the market! Many people believe that a battery-powered backup sump pump would be preferable, and if you have a well as your primary source of water it is your only option, but that type of pump is only reliable for as long as the battery lasts. The only reason I would not suggest the Liberty Pump SJ10 as a backup sump pump is if you only have access to well water, otherwise it is a great option!